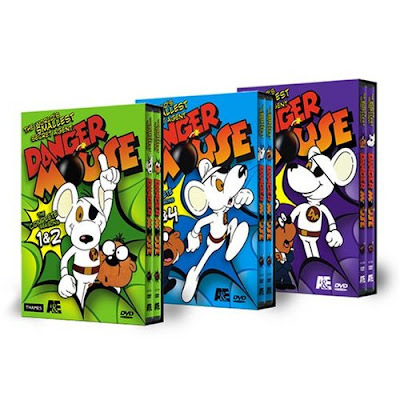 Thanks to a couple of paid ads that ran on my site late last year, I accumulated enough money in my PayPal account to order the Danger Mouse DVD collection on Ebay. WooHoo! I used to watch Danger Mouse when I was in college. Particularly one summer it became a late afternoon ritual for me and several of my friends (Mark Ude, Mike Miller) to gather in my dorm room and watch DangerMouse, which was then being broadcast on the Nickelodeon cable channel. Something about the silly British humor caught our fancy back then. Think Progress has a link to a chart that lays out the complete and utter failure that the Bush presidency has been. It is not a pretty picture. When you compare the eight years of the Clinton presidency with the eight years of the Bush Jr. presidency you see a nation that is in decline. Real GDP growth was about half what it was during the Clinton years. The national debt went up more than $3.5 trillion. Job creation has been anemic throughout the Bush years. More Americans are in poverty. More Americans are uninsured. The cost of health insurance for families has doubled. Gas prices have tripled. Personal savings rates have declined. Consumer credit debt has nearly doubled. The U.S. trade deficit has doubled. The value of the dollar has plunged. U.S. combat readiness has done a complete aboutface. Our foreign oil dependency has increased. And our nation’s favorability rating around the world has spiked. But it is important to remember that this complete and utter disaster of the past eight years was not all George W. Bush’s fault. It was, instead, the utter failure of the conservative governing philosophy. Bush faithfully followed the conservative mantra in almost every area and it has failed to do what it was supposed to in most cases and in many others it has done the complete opposite. So, if we simply replace Bush with another Republican who will continue the same failed policies, we will continue to decline as a nation. 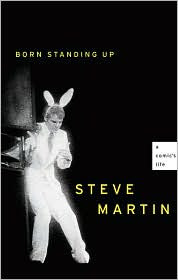 I just finished reading Steve Martin’s new autobiography “Born Standing Up” and I thorougly enjoyed it. My mother gave me the book for Christmas because she remembers what a huge Steve Martin fan I was when I was a kid. Steve’s “Wild and Crazy Guy” album came out when I was in junior high school and it made a huge impression on me. I devoted large sections of the record to memory and I even made my parents take me to see the “Sgt. Peppers Lonely Hearts Club Band” movie simply because Steve Martin had a cameo role in it. (He sang Maxwell’s Silver Hammer). I had no idea who the Beatles were at the time, much less the Bee Gees. A friend at school and I were going to spend the summer of 1978 working on a “King Tut” record pantomime for speech class the next year, but my family moved over the summer and I never go to do it. My Steve Martin obsession waned a bit after that, although I did group improvisational skits in my high school speech classes that were greatly influenced by his humor. The book talks about the poor relationship that Martin had with his father while growing up. It takes you through his early years of working at Disneyland and later at Knotsberry Farms where he acquired his magic act that slowly evolved into a comedy routine. In a lot of ways he benefitted from being in the right place at the right time. He got lucky and landed a gig as a writer for the Smothers Brothers and that opened doors for him in other comedy circles. His fame slowly increased throughout the late 60s and early 70s and then skyrocketed in ‘77-78 when he became national phenomenon and suddenly went from playing packed nightclubs to doing concert arenas and stadiums with thousands of people. For a time there, his experience was similar to what the early Beatles went through, except that he was a solo act and had no one to share the journey with. He began suffering anxiety attacks that plagued him for the next 10 years. Fortunately, Martin’s story has a happy ending in that he walked away from his stand-up career at the pinnacle of his success and launched a moderately successful movie career. He admits that there is such as thing as being too famous and he feels now that he has reached that point where he is just famous enough. I am both happy and disappointed with the Oscar nominations this year, which is probably a very typical response. Best Picture will be a race between “There Will Be Blood” and “No Country For Old Men”. “Michael Clayton” is the John Edwards in this race. You have to pay attention to him, but you know he’s not going to win. “Juno” is this year’s “Little Miss Sunshine” and “Atonement” should not be in this category at all. It did not receive a directors nod or a Best Acting nod, so how could it end up in the Best Picture category? They should have picked at least one semi-popular film that more than a handful of people have seen to fill the slot wasted on “Atonement”. My pick would have been “Ratatouille”. I’m very happy with the Best Actor category. I like all the nominees this year, but it is obvious that Daniel Day-Lewis has this category all wrapped up. They might as well just put the statue in the mail for him right now. There is no way any of the other nominees will claim the prize this year. George Clooney already got one, so he is out. Johnny Depp is overdue for an Oscar, but it won’t be this year. Viggo Mortensen’s career just got a big boost and I expect he will get a lot more juicy roles in the near future. And Tommy Lee Jones, while very deserving, got nominated for the wrong movie. What happened to “No Country For Old Men”? I don’t have a clue about the Best Actress category other than to say that it won’t go to Cate Blanchett because she is going to win for Best Supporting Actress. Nor will it go to surprise nominee Laura Linney or the too-young Ellen Page. So that leaves Julie Christie or Marion Cotillard, neither of whom I know anything about. In the Best Supporting Actor category the winner will be Javier Bardem for “No Country For Old Men”. In the Directing category, the prize will go to whoever wins Best Picture - either Paul Thomas Anderson or the Cohen Brothers. The Animated Feature award had better go to Ratatouille or I will be ticked! The stock market is tanking today as expected and the inevitable Bush Recession is bearing down on the country. We Texans may not get hit as hard as the rest of the country, but that also means it will be getting more crowded as folks who lose their jobs elsewhere pack up their families and move to the Lone Star State. I’ll be curious to see what kind of gyrations the wingnuts go through to try and blame this on Clinton and/or the Democrats. Too bad my friend Bill has gone missing. I suspect he is just in a deep funk right now because nothing he has been touting for the past several years is going the right way - from the quagmire in Iraq to the Republican election debacle (Rudy!). But if it wasn’t already obvious that the Republicans are going to be non-factors in this fall’s election, the Bush recession will put the nail in that coffin. There is no way the country is going to support any of the awful candidates they currently have vying for the nomination. Now if we Democrats can just keep Hillary and Obama from scratching one another’s eyes out until after the primary is over, things should settle down into a pretty good year for our side. Good government principles and fiscal responsibility are making a comeback as is foreign policy realism. It may take some time to extract ourselves from the mess that Bush created for us in Iraq, but it will certainly go much faster with a Democratic administration rather than with a “Bush-on-steroids” John McCain presidency (h/t Pat Buchanan). All we have to do now is survive one more year of the worst presidency of all time. Keep your fingers crossed! Imagine if the local newspaper (San Antonio Express-News) decided to do a big feature story on mariachi music in San Antonio, but then interviewed just one guy who plays the guitarrón. That is essentially what they did the other day for a story about blogging and politics when the only local blogger they talked to was my friend Nick Marinelli at Conservative Dialysis. I’ll admit that this was at least an improvement from the last time they did a feature on blogging when they couldn’t find any local bloggers to talk to and had to go all the way to Austin to find someone to feature. In 2004, conservative bloggers successfully debunked a "60 Minutes" story that purported to show President Bush received preferential treatment in terms of his National Guard service. What they “debunked” was the network’s confidence in some faxed documents on which they based a particular story about Bush’s National Guard service. It is still unclear whether or not the documents were truly forgeries and, if so, who made them and why. What was not “debunked” was the fact that George Bush recieved preferential treatment in terms of his National Guard service. That much, at least, is unquestionably true, and the whole 60 Minutes controversy served only to obscure this fact. I recently listened to a 7-CD course on Rhetoric and the Art of Persuasion that I found at the library. The professor spent a lot of time touting Martin Luther King Jr.’s “I Have A Dream” speech as one of the best examples of American Rhetoric, right up there with Lincoln’s Gettysburg Address. He was right. This is without a doubt one of the best oratorical performances of all time.